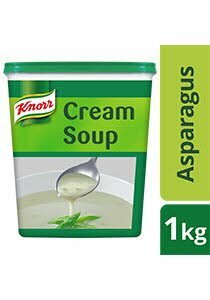 Knorr Cream of Asparagus Soup is made with selected high quality ingredients and delivers consistency in preparation and taste. Wheat flour, cornstarch, plam fat, skimmed milk, sugar, monosodium glutamate, yeast extract, asparagus, edible gum, onion, spices, sodium inosinate and guanylate. All food additives are of plant origin. May contain traces of cereals containing gluten, egg, fish, crustaceans, molluscs, soy, peanut and tree nuts. 1. Dissolve 1000g of soup mix into 4.7L of water to form a soup mixture. 2. Stir in the soup mixture into 9.3L of boiling water. 3. Add in preferred ingredients. 4. Whisk and simmer for 5 minutes. 5. For creamier soup add in cream/milk. Replace lid tightly. Store in a cool dry place. 0 140 Points X3 POINTS!